I can’t get enough of them! Who knew how versatile this delicious, simple fruit could be. Of course, we all love grabbing a banana on the go for an afternoon snack or for a quick breakfast when we’re running late for work. But did you know that there are so many more ways to use bananas than in it’s simplest form? My new favorite thing to do, and probably the most useful, is freezing bananas. I usually buy a super ripe bunch of bananas at the beginning of the week (along with a not-so ripe bunch to be used for later in the week) and slice them up into coins for freezing. I usually start with anywhere between 7-8 ripe bananas in the freezer and by day 4 of the week they are almost all gone! Frozen bananas are great for use in smoothies and smoothie bowls because when thawed slightly and put into a blender, they create such a creamy texture that makes anything taste amazing. If you love your smoothies thick, or are looking to create a smoothie bowl with that ice cream consistency, then frozen bananas are your new best friends. Along with smoothies, you can make my personal favorite frozen banana treat: banana nice-cream. It’s called nice-cream because it is just as delicious and creamy as ice cream but without all of the added sugars and fats that come along with the popular dessert. Who doesn’t want a healthy and yummy treat after dinner, especially in the summer time! All banana nice-cream consists of is frozen bananas. Yepp, you read that right. Simply place 3-4 frozen bananas in a blender or food processor and pulse until thick and creamy. You can add a little water as you go to get the process moving, then top with your favorite fruits, nuts, granola, peanut butter, you name it! Another way you can use bananas is in baking. I often use a mashed up banana or two as an egg replacement to make things like cookies, cakes, and banana bread. A simple cookie recipe that I love to make only involves a few ingredients: Oats, mashed banana, peanut butter, and chocolate chips. Simple mash the bananas up in a bowl, then add the rest of the ingredients and mix either with your hands or with a fork until it creates the cookie dough. Then separate the dough and place on a cookie sheet and bake at 350 degrees for 10 minutes or so. It’s that simple and I promise they won’t disappoint. So what I am trying to get at here, if you couldn’t already tell, is that bananas are AWESOME. 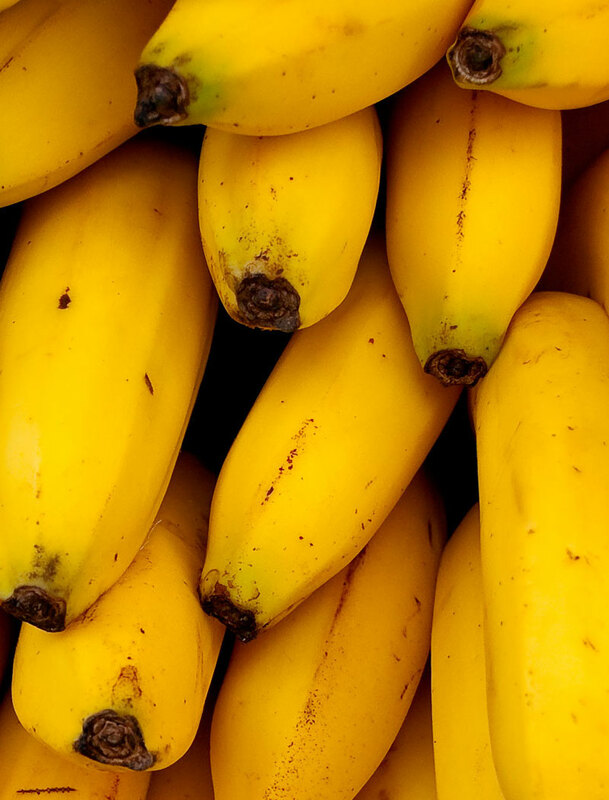 There is so much you can do with them so next time you go to the super market make sure to grab an extra bunch of bananas and experiment with this delicious fruit!